These pages are dedicated to the CKA dan grades who provide the very high standard of training at our Dojos. Dave is the Chief Instructor of Chiltern Karate Association. He started his karate journey with the KUGB (JKA) in 1979 and has trained continuously in Shotokan for more than 40 years. For many years he was a regular visitor to the Martial Street dojo and has many friends from that golden era. In his younger days he competed at National & International level and recently returned to competition (as a veteran), coming 1st in Kumite and 3rd in Kata at the JKA England Open event in 2016. He is a 6th Dan Shotokan Instructor and teaches at the Holmer Green Dojo. Dave trains regularly with top European & Japanese Shotokan Instructors and has completed three visits to train in Tokyo. He recently took eight CKA students to Japan in February 2018 and the group were fortunate enough to experience training at the JKA Honbu, the Budokan, the Hoitsugan Dojo and Takushoku University. Erin has been training in karate since January 1992. She attended a beginners’ course at the Chesham Dojo where she is now one of the Instructors. She attained Yondan in December 2005 & Godan in December 2010. Juliet started training as a beginner in March 1998 in Denham. She reached Shodan in March 2003, Nidan in March 2005, Sandan in June 2008 and was awarded Yondan in September 2012. After teaching at the Chalfont dojo between 2003 and 2014, she now trains regularly at the Holmer Green dojo. Paul started training in January 2000 at the Grammar School in Aylesbury as a beginner. He reached Shodan in December 2003. 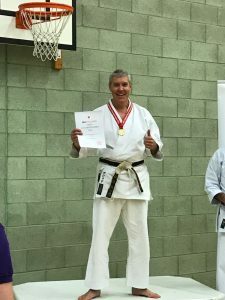 He teaches regularly at the Aylesbury dojo and Holmer Green dojo and tries to train at the Amersham Dojo as much as possible. He attained Nidan in June 2006, Sandan in March 2010 and was awarded Yondan June 2014. Michael trained for five years in the early 1990’s with the Mushindo Kempo Association in London. After a break of ten years he started training with the CKA, attaining Shodan in December 2009 and Nidan in December 2011. 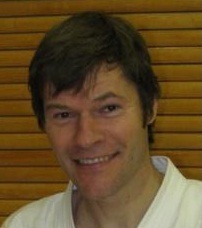 Michael trains in Holmer Green and regularly teaches at the Dojo Amersham Dojo. Bernard started his training in karate in Dublin in 1988 and graded to 7th kyu. After a long break, he joined the CKA in October 2004 at the Denham Dojo (now closed) and graded to Shodan in December 2008, attaining Nidan in September 2011. He now trains regularly at the Holmer Green dojo and the Amersham dojo. Ashley was our Chief Instructor until June 2018, when he decided the time was right to follow another path of Budo. He attained Rokudan in Shotokan and Yondan with Rick Clark’s Ao-Denkou Kai organisation. Craig joined the CKA in 1990 training at Amersham, Bucks University and Holmer Green. He attained Godan in Shotokan and Sandan with Rick Clark’s Ao-Denkou Kai organization. Robin joined the CKA in 1992 training at Amersham, Aylesbury and Chesham. A past editor of The Lion, he attained Sandan in July 2002 and Yondan in 2006. Brian started training in Karate with the CKA in early 1991 at the age of 11, and he graded to Shodan in December 1995. He attained Nidan in June 2005, Sandan in June 2008 and was awarded Yondan in September 2012. 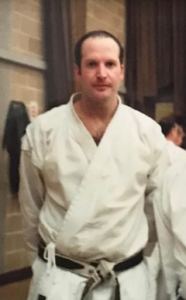 Mick trained in Shotokan from 1990-93 reaching 2nd kyu until injury forced him to stop. He joined the CKA in 1999 training at Denham and Amersham. He attained Shodan in March 2003 and Nidan in June 2005. Caroline joined the CKA in 2000 training at Denham and Amersham. She attained Shodan in September 2004 and Nidan in March 2007. George joined the CKA in 2003 training at Aylesbury. He attained Shodan in December 2007 and Nidan in December 2009. Margaret began training with the KUGB in Edinburgh in the late 1970s. After an extended break, she joined the CKA in 2001. She attained her Shodan in September 2006 and Nidan in March 2010.